In this riveting novel, Schilling delivers a psychological thriller that leads the reader on a collision course where every breath, every step can carry the gravest of consequences. She paints bold and unforgettable characters, while resurrecting disturbing and powerful apocrypha that had been all but buried under contemporary religious doctrine. 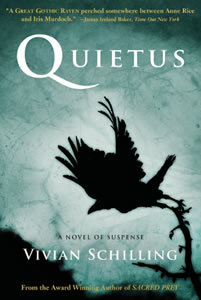 With spellbinding intrigue, Quietus takes the reader to the brink of reason, to the edge where spiritual and physical meet, building with frenetic momentum to its shocking and haunting climax.